The Buffalo Trace Distillery distillery is located on the Kentucky River in Frankfort, Kentucky in what was formerly Bourbon County (now Franklin County). It has been well known in the past under several other names like the George T. Stagg Distillery or the O.F.C. (Old Fire & Copper) Distillery. The distillery makes the largest number of whiskies in the world spanning some 83 different labels, brands or variations. The Flagship label, Buffalo Trace Kentucky Straight Bourbon, was introduced in August 1999 and was named after the land bank on which the operation is located where Buffalo crossed the river. I picturesque view of the Buffalo Trace Distillery nested in foothills just outside Frankfort, Kentucky. The distillery itself is 225 years old and is the oldest continuously-operating distillery in North America. All brands and the distillery were purchased by The Sazerac Company in 1992. Sazerac is an American company that is family owned out of New Orleans, Louisiana. 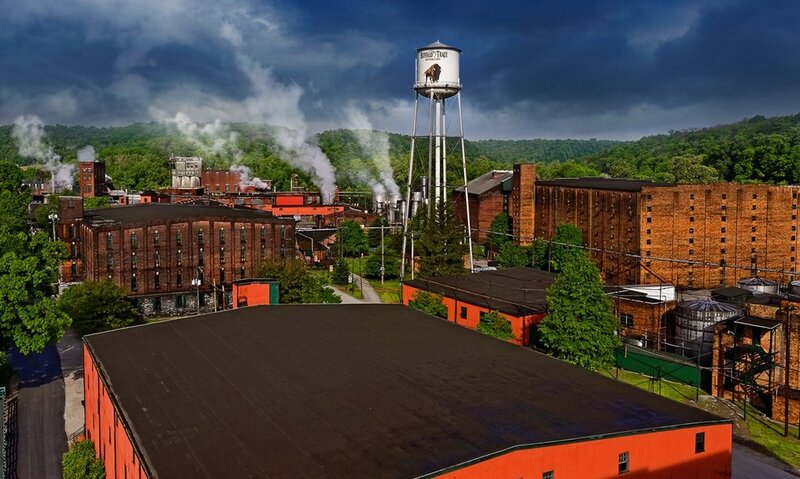 Today Buffalo Trace's makes over 83 different labels, brands or variations of North American whiskey. In 1773 Hancock Taylor and the McAfee brothers survey the town of Lee's Town and the land on which the distillery sits today. In late 1786, Commodore Richard Taylor, a revolutionary war veteran who fought with the General Marquis de Lafayette, constructs a one-story stone house on the banks of the Kentucky River (a second story is added in the early 1800's). In 1792, the same year that the Commonwealth of Kentucky becomes the 15th state in the U. S. The "Old Taylor House" is the oldest residential house still standing in the state of Kentucky. In 1811, barrels of whiskey and store goods are sent from a newly constructed three-story warehouse on the river to New Orleans for the first time. Benjamin Harrison Blandon was the distiller at the time. Some of the Administration of Whiskey University posing with Bourbon Hall of Famer Freddie Johnson at a tasting after a Tour at the Buffalo Trace Distillery. 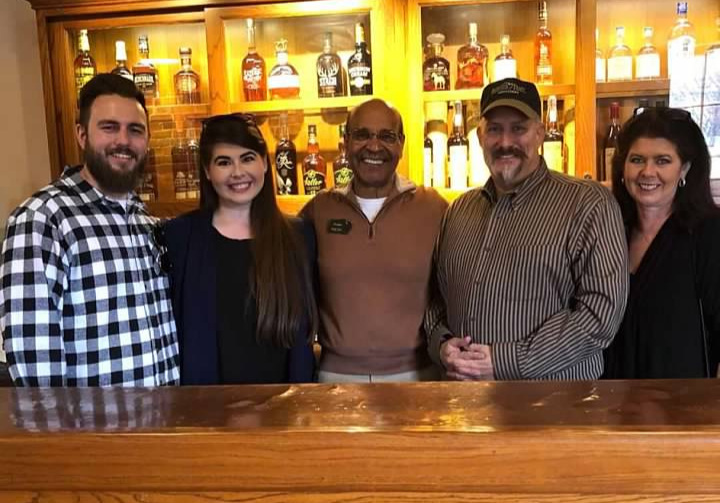 Pictured above are Professor Nicolas Goodall, Web Master Alexandra “Lexie” Duncan, Buffalo Trace’s Freddie Johnson, Founder of Whiskey University Professor Colonel Craig Duncan and Administrator Melissa Duncan. In 1858 Daniel Swigert borrows money from banker Edmund Haynes Taylor, Jr. to build a full-blown distillery on the riverside site right next to the warehouse. In 1870 after a little financial trouble Taylor, now referred to as Colonel E. H. Taylor buys the distillery. He renames it "O.F.C.. Distillery" on the belief that only the finest whiskey can be produced Old fashioned, wood Fire heated Copper Pot Stills (Ole Fire & Copper). In 1872, Taylor invests $70,000 to rebuild and upgrade the distillery including many new mechanical features fostered during the industrial revolution. In today's dollars, $70,000 would be equivalent to $13,300,000.00 deemed a small fortune at that time. In 1878 the O. F. C. Distillery is purchased by business partner George T. Stagg but it is financed through a loan from Colonel Taylor. Stagg builds two huge warehouses that house over 20,000 barrels each, Warehouses A & B still stand today. In 1883 a lightning prompted fire destroys the distillery, it is completely rebuilt the distillery but upgrades everything with a massive insurance settlement and another $44,000 out of Stagg's pocket. In 1885 Warehouse C is built and in 1886 all three are steam heated, a first at the time and an idea given to him by Taylor. After the distillery was rebuilt with Column Stills instead of pot stills, huge fermenting and mashing tanks added and the warehouses built and then heated, Colonel Taylor's dream of "The World's Most Efficient Model Distillery" was complete. Buffalo Trace's makes over 83 different labels, brands or variations of whiskey. The most popular bourbon brands include; Blanton's Single Barrel, Pappy Van Winkle, the Colonel E. H. Taylor, Jr. bonded series, Eagle Rare, Buffalo Trace, Benchmark, Ancient Age, Old Charter, George T. Stagg, Elmer T. Lee, W. L. Weller, Hancock's President's Reserve, Rock Hill Farm and Bowman Brothers. Some of Buffalo Trace's other popular North American whiskies include; Southern Comfort, Sazerac Rye, Fireball, Rich & Rare, Canadian Hunter, Forty Creek, Northern Lights, Caribou Crossing, Royal Canadian, Canadian Supreme and Dr. McGillicuddy's Flavored Whiskies.